Operation Groundswell trips are known for providing first-time experiences. First plane ride, first trip abroad, first major volunteer project…first time eating coagulated ox blood soup? Yesterday on the Haiti Education trip, our lovely ladies got to experience the thrill of a motorcycle ride for the first time. On our way to Cité Soleil for a Kreyol/English language exchange, everyone got over their initial fears and loved the experience. But as you’ll see, its all about safety first with our super cool helmets. 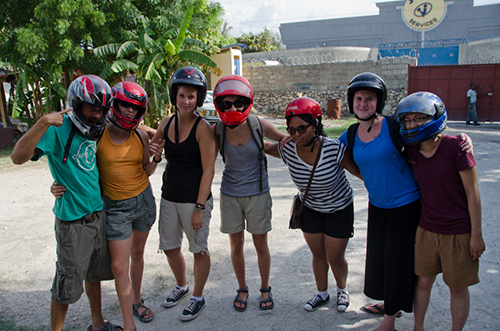 So here’s to the first time… OG Haiti Education Ridin’ Dirty!